For State media, this is what you should be angry about. Not the shortage of toilet paper, but THIS. Venezuelan State news agency AVN is apparently angry. But why? Is it because of the toilet paper shortage? Or perhaps because of recent events of violence in Cojedes State? No, and no. According to this report, the evil search engine Google (in deep alliance with the “international right”) is allegedly mocking Nicolás Maduro by deliberately putting manipulated images on his biographical sketch and ridiculing him in the Internet. As someone that usually googles Maduro for work reasons, I never saw that particular image of him until AVN brought it up. And after State media’s latest attempts to present “the truth” of what happens in Venezuela have backfired, I must say: this seems legit. 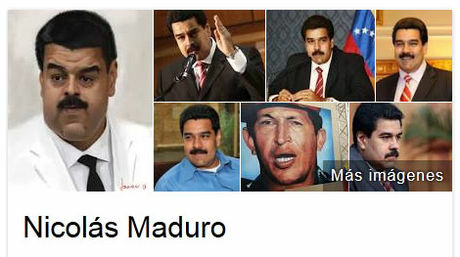 UPDATE: Google has withdrawn the questioned image of Nicolás Maduro, in accordance to its internal rules. The company offered no comments about AVN’s accusations. Previous articleHow do you eat a barrel of oil?